It's time for the Rome Braves to gear up for another season at State Mutual Stadium. We're looking for energetic, hardworking people with outgoing personalities to add to our part-time/seasonal game day staff. 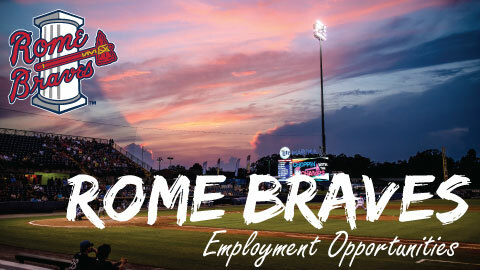 Stop by the Rome Braves Front Office at State Mutual Stadiumto fill out an application today. All applicants must be at least 16 years of age and able to work nights, weekends and holidays. Online applications/resumes are not accepted. Applicants must apply in person at State Mutual Stadium. Applications are accepted from 9:00 AM to 4:30 PM Monday through Friday. Below is a list of possible positions for the 2018 season.